South Yorkshire based engineering company, Qualter Hall, is pleased to announce a series of new international orders worth in excess of £5 million. Following these latest projects, the company will have experience of working in over 25 different countries Worldwide, and, with a strategic international initiative firmly in place, the company's exports currently account for approximately a quarter of their total business. In 2008, devastating floods, as a result of Tropical Storm 'Arthur' washed away the original Kendal Bridge in Southern Belize. A temporary causeway replaced the bridge to allow for access in the area, but during heavy rainfall the causeway is forced to close, resulting in disruption and inconvenience to local inhabitants. The project is being undertaken on behalf of the Government of Belize and will be funded by the Caribbean Development Bank. Qualter Hall was awarded the contract for the bridge via main contractor, Cisco Construction Ltd of Belize. Qualter Hall's involvement will include the design, manufacture, supply, supervision of installation and commissioning of one 90 metre long steel Modular Bridge (approximately 325 tonnes), including all the necessary installation equipment. The bridge is due for delivery in August 2011. The site for this new bridge is in the island province of Bangka Belitung and will be a 99.5 metre long Bascule Bridge forming part of a four lane bridge with a total length of 784.5 metres. When raised, the Bascule Bridge will allow large ships to pass through. The bridge will be a major landmark in the area and it is hoped that it will help the development of tourism as well as commercial development within the region. Qualter Hall has been awarded the contract for the 99.5 metre long by 23.2 metre wide, two leaf Bascule Bridge, in partnership with sister company, Waagner Biró Indonesia. 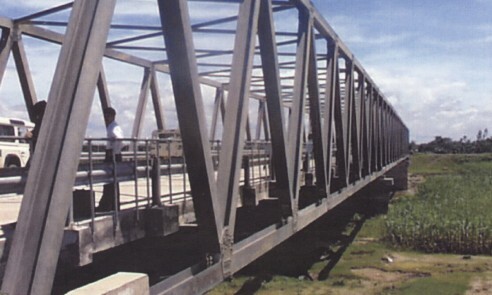 Qualter Hall's scope covers the design, manufacture, supply, supervision of installation and commissioning of all the hydraulic equipment necessary for operation of the bridge, including the cylinders, power packs, pipework and ancillary items, along with all electrical control equipment necessary for the operation of the bridge, with Waagner Biró Indonesia providing the bridge superstructure. Qualter Hall's engineers are scheduled to be in Indonesia in March 2012 for the installation and commissioning of the bridge. Qualter Hall's Large Presses/Heavy Metal Forming Machines Division (Hugh Smith Engineering) has been awarded, against international competition, an order from Bharat Heavy Electricals Ltd, for the design, manufacture, supply, installation and commissioning of a 4000 tonne x 3.6 metre capacity Vertical Plate Bending Machine. Bharat Heavy Electricals Ltd, is the largest engineering and manufacturing enterprise in India's energy related infrastructure sector. Its product range includes equipment for the Hydroelectric, Power Generation, Nuclear, Marine and Oil industries. The machine will be located at their main facility in central India, where Qualter Hall has previously provided four other machines. This particular Vertical Plate Bending Machine will be capable of bending plates in a cold condition, working on a progressive 'press-bend' principle with a maximum plate width of 3.6 metres and maximum thickness of 200mm. Qualter Hall's engineers are scheduled to be in India in January 2012 for installation and commissioning of the machine. Qualter Hall has received an order from Managem/SMI Casablanca, for the design, manufacture, supply, supervision of installation and commissioning of one 175kW Double Drum Hoist, complete with DC Motor. The hoist will be used to transport men and materials within the mineshaft of a silver ore mine in Morocco. This is due to be delivered in July 2011.